It is the detail that defines the traditional kitchen and creates the eye-catching elements that make your visitors gaze in admiration. It could be the architectural detail that impresses, the arches, pilasters, corbels or mouldings. Perhaps it is the use of glazed units with arched windows or decorative glass. It could even be the incorporation of traditional dining room furniture styles, for example a display cabinet, into the whole design. Often it is the blend of many of these elements that give the overall traditional look. There are a variety of styles that can be adapted to create that bespoke kitchen look. From cabinets in classic solid wood to painted finishes in timeless shades and worktops in beautiful timber or luxurious granite, there are many ways to create a traditional kitchen that is unique to you. 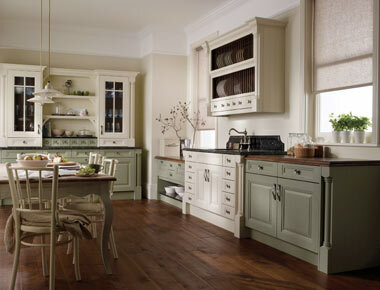 But don't think that traditional kitchens need to be old fashioned when it comes to functionality. Modern interpretations combine classic styling with appliances, storage options and accessories that offer all the conveniences that today's kitchens deliver. We offer a free kitchen design service to help you get the kitchen you really want, and can supply cabinets, doors, drawers and worktops as well as handles, drawer boxes and appliances. Because we are an independent online supplier we're able to keep our prices much lower than the high street, while offering superior quality products that you won't find at your local DIY chain store.